During an event earlier tonight celebrating Arrow's one hundredth episode, series showrunner Marc Guggenheim confirmed the episode's title -- as well as that of the DC's Legends of Tomorrow episode it crosses over with for good measure. 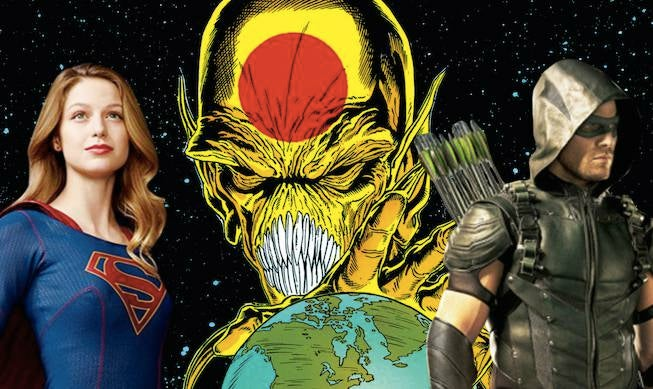 While Arrow takes its hundredth episode to celebrate the four-plus seasons that have come before, it also has to balance the needs of a four-show crossover that will bring Supergirl into The Flash, Arrow, and DC's Legends of Tomorrow. The crossover is based on the 1988 DC Comics event series Invasion!, in which The Dominators led an alliance of alien races against Earth after fueling hysteria that our superhuman population was too large and too powerful to go unchecked. "I'm giving you an exclusive -- becuase you're the only one who's asked," Guggenheim joked. "Arrow episode 508 is called 'Invasion!' with the exclamation point. And Legends of Tomorrow 207 is going to be 'Invasion!'. I'll leave it up to you to guess what The Flash is called." When Guggenheim shared the cover sheet for Arrow episode 100 -- one of the three shows that cross over directly as part of the crossover -- its title was blacked out except for an exclamation point on the end when Guggenheim shared it on Twitter. It seemed likely after The CW announced the Dominators as the crossover's villains that the title was in fact Invasion! -- but The CW wouldn't confirm it at the time. The story was written by Keith Giffen, utilizing and tying up dangling plot threads from his time on Justice League International, Omega Men, and Legion of Super-Heroes, and featured art by McFarlane and Bart Sears, both of whom would go on to become superstars in the '90s. It was published in three oversized issues and, in one of the most famous publicity stunts of the '80s, DC's editorial team published a special episode of the Daily Planet, which featured the same design as the paper inside the story, with a full-page headline that said "Earth to Invaders: Drop Dead!" Supergirl airs on Mondays at 8 p.m.; The Flash on Tuesdays at the same time, Arrow on Wednesdays, and DC's Legends of Tomorrow on Thursdays. The crossover is expected to air in early December.